All the L’Arche communities around the world belong to the International Federation of L’Arche communities. The role of L’Arche International, as a unifying organization, is to support its members administratively, legally and financially and help them live out their mission. L’Arche International also seeks to promote cultural and religious diversity within its communities, as well as practical international solidarity both within and outside the Federation. L’Arche International is dedicated to the creation and growth of homes, programs and support networks where people who have intellectual disabilities and people without intellectual disabilities live mutual relationships and share the daily life, building community together. There are currently 147 communities in 35 countries. Each community comprises of homes and day programs, which operate according to a not-for-profit model. 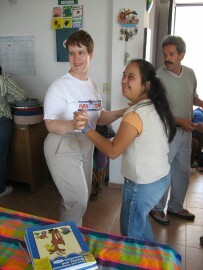 Our model of care is unique: people with intellectual disabilities are at the heart of L’Arche – not as clients, patients, or recipients of services but as friends, teachers and companions. L’Arche supports the personal growth and development of each member so that they can fully develop their potential. Communities provide work, therapeutic and leisure activities that are a source of dignity and fulfillment for their members. L’Arche communities give each person the confidence and skills to grow, to achieve their life-goals, to make a contribution to society regardless of their intellectual and physical limitations. This is done through the development of long-term mutual relationships, providing a stable home environment, on-going training of those who provide assistance to community members with disabilities, and partnerships with professional care providers and government authorities.